The DNA Behavior Assessment is comprised of 46 sets of three non-situational items (pairs of phrases) that relate to one of the 8 factors using a forced choice rating (most like, least like) methodology. A total of 138 items are rated. The “forced choice” rating system is used because it has been shown to provide the most reliable methodology for predicting behavior in the work environment. The 46 three-question sets of words/phrases used in the assessment were determined by experienced subject matter experts on the DNA Behavior Research team, which included the I/O psychologists from Georgia Institute of Technology who performed the independent validation work. Collectively the research and development team represented more than 100 years of relevant experience in developing and deploying behavioral assessment instruments. The DNA Behavior Assessment is structured to assess eight major personality factors as well as 24 related subfactors. These measures of behavior are designed to be more specific than Costa and McCrae’s (1985) measure of the “Big Five” and other personality inventories, as it captures important dimensions of behavior on how people make decisions, interact and build relationships, achieve results, handle information and complete tasks, develop trust, set and achieve goals, take and live with risks and learning styles. The words and phrases used in the DNA Behavior Assessment were originally determined by subject matter experts (SMEs). These SMEs also created a preliminary model for predicting which items were assigned to which factors. Confirmatory factor analyses (CFAs) were conducted on both the major factors and subfactors to provide data regarding the contribution of each item to its respective factors. M-Plus statistical software was used to conduct the CFAs. These analyses employed polyserial correlations and maximum likelihood estimation to determine the standardized estimates of path coefficients. Exploratory Factor Analyses (EFAs) were conducted on both the major factors and subfactors to provide data regarding which items were most related to one another. EFAs were conducted using M-Plus statistical software and polyserial correlations. All EFAs were (obliquely) Varimax rotated to maximize simple structure of the factors. The predicted model created by the SMEs held up very well with only a few adjustments required after the CFAs and EFAs were completed. The SMEs used the results of the CFAs and EFAs to inform decisions regarding which items needed to be changed as well as which items needed to be added to or taken away from each major factor and subfactor. The SMEs used this information to refine their research, ultimately reaching the final model. The Command factor correlates .71 with the VPA Dominance factor. The People factor correlates .80 with the VPA Extroversion factor. The Patience factor correlates .87 with the VPA Compassion factor. The Structure factor correlates .84 with the VPA Conscientiousness factor. The Pioneer factor correlates .70 with the VPA Ambitious factor. The Risk-taker factor correlates .73 with the VPA Daring factor. The Creative factor correlates .74 with the VPA Innovation factor. [i] The Trust Factor was added after the original validation. Scores were rationally derived using scores of several of the factors. Subsequent to the original validation, items for the Trust factor were selected and validated using methodologies similar to the process described above. The performance of the DNA Behavior Assessment has been monitored since December 2009 on a regular basis, using new data that is received from participant usage. In December 2013, the original model was reviewed, based on a randomly selected sample of 10,000 users. A statistical re-norming exercise showed no material differences that would necessitate changes to the factor scoring model. The DNA Behavior Assessment has been used in forty-seven countries and translated into five languages. Usage now exceeds 1.5 million people on an annual basis. LBDNA was created in partnership with DNA Behavior International. Hugh Massie, DNA Behavior CEO and Founder, established the business in 2001. As an international behavior tech firm, DNA Behavior empowers people using validated people insights for improving decision-making, enhancing relationships, unlocking human potential, and managing business risks. Since commencing business, DNA Behavior services people and organizations in over 123 countries through 11 languages and has 12 proprietary DNA Behavior Discovery Processes. Contact Us to learn more about our psychometric and statistical validation process. 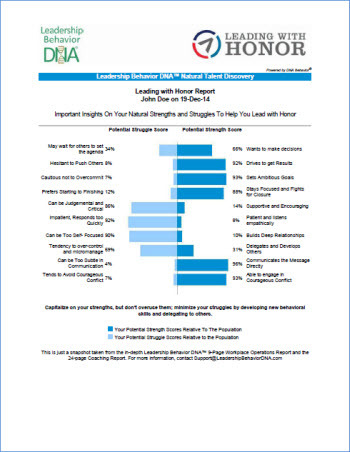 Contact a Leadership Behavior DNA Representative to learn more and get a customized quote on LBDNA report and service options.